Portronics has launched “Harmonics 200”, adding to its existing HARMONICS series. With this launch, Portronics has brought in a smart Retractable Neckband Earphone with superior tuned drivers, latest Bluetooth 4.1 technology along with noise reduction technology. The Harmonics 200 has ergonomically designed ear hooks, with snug fit ear buds, a durable Silicon Material neckband and a lightweight body of 67grams, without creating any mess of dangling cables around you and super comfy to wear. Easy Control Buttons allows you to play music and take calls effortlessly with just one-touch control by simply pressing them. With its superior tuned drivers, advanced CSR Chipset, and CVC background noise reduction technology, Harmonics 200 Wireless neckband headphones give crystal clear hi-fi stereo music and call audio quality. Advance Bluetooth 4.1 technology offers clearer sound quality and lower power consumption, a more stable connection with your Bluetooth enabled device at an impressive distance of 10 meters away from the source device. 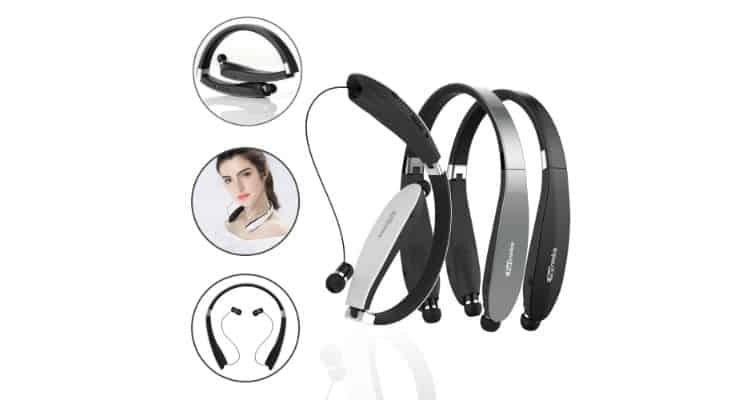 Harmonics 200 Bluetooth headset can be connected to most of the Bluetooth enabled devices. The powerful rechargeable battery provides up to 18 hours of continuous talking/music time and 300 hours of standby with a single charge. Hydrophobic nano coating and IPX5 rating ensure effortless performance in practically any environment like in running, jogging, hiking, yoga, exercises, gym, fitness, travelling and etc. Additionally, Harmonics 200 comes with 3 pairs of ear tips of L/M/S sizes for your ears. Portronics Launches Harmonics 200 – Retractable Neckband Earphones 0 out of 5 based on 0 ratings. 0 user reviews.